Mango parties are a special event and a source of enjoyment in summer. 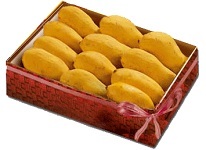 Every one can have these mango parties. Families can enjoy these parties with relatives and youngsters can have it with their friends and can have a great quality fun with the king of foods. Even children can have and enjoy and organize these parties at their school level. To me the best and the precious summer gift which you can offer to someone special , relatives and friends is THE PAKISTANI MANGOES. I promise and i assure you this would be the best ever gift you would give to anyone.